This week consisted of a tonsillectomy, Spirit week and a carnival at school, a sick baby, and a ton of rain yesterday. Now it’s Halloween and needless to say I haven’t made much progress on the patio.I was able to finish the first coat on the addition, but that has no affect on the patio So, I’m left to only dream about how I want this patio to turn out. My goal is to have the patio finished and ready to receive guests for our Friendsgiving next month. Once I get the second coat of paint on the walls, I’m going to focus on the door. I’ve decided to go with a classic gloss black. Not only do I love the way it looks but black and white is the perfect backdrop for any color scheme I choose. After the door, I have got to tackle the cement floor. After years of DIY projects, it has taken quite the beating. It needs some serious help. I already have cement paint in white and grey. The grey seems appealing to me but I don’t think simply painting will do the job. There are a few cracks in the slab and I think it would take too many coats and gallons of paint to cover the messes I’ve made. I have been doing some research on Rustoleum Restore. 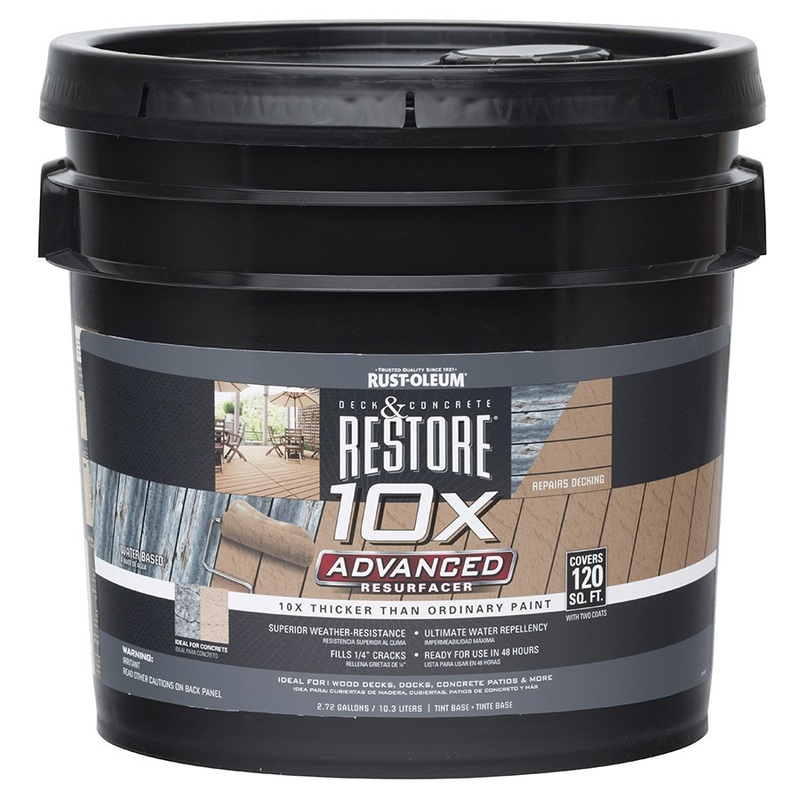 It’s $69 at Lowes for this 3 gallon container and it’s supposed to cover 120sq ft with 2 coats. It’s tintable too. Most of what I’ve read is really good. Of course you can’t please everyone and there were some unhappy customer reviews on the Lowes website. I think if I do a well enough job preparing the concrete, I should be fine. I’ll give a full report on the process and how it turns out. After I’ve finished the big hard jobs I can focus on the fun part, decorating. I’ve always wanted to hang some big long curtains out there and now I can finally get to it. I mean how nice is this?! Not only will it be beautiful, it will help keep the dirt and leaves off the patio! I plan on using drop cloths from Lowes for the curtains, but I haven’t decided how I want to hang them. I have a few ideas but I always have to think about my budget of course. I really like the galvanized pipe look but that can get pricey. Maybe I can come up with a cheaper way and achieve the same look. I already have patio furniture, I just need to spruce up the accessories a bit. Hopefully this rainy weather will stay away long enough for me to make some real progress this week or even better, complete this project!